went on tonight. Alice did nearly all the work. I felt so badly John & Hatt were out in the evening. Friday August 10th 1894. I felt some better today. Mother & Robbie were out and stayed all day. I knit a little in the afternoon weather a little cooler than yesterday. 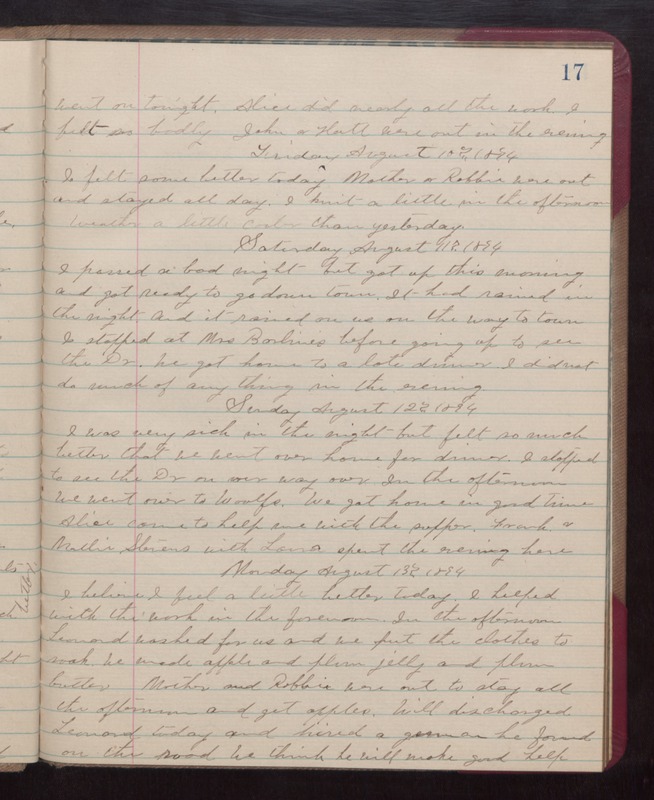 Saturday August 11th 1894 I passed a bad night but got up this morning and got ready to go down town. It had rained in the night and it rained on us on the way to town. I stopped at Mrs Borlines before going up to see the Dr. We got home to a late dinner. I did not do much of any thing in the evening. Sunday August 12th 1894 I was very sick in the night but felt so much better that we went over home for dinner. I stopped to see the Dr on our way over. In the afternoon we went over to Woolfs. We got home in good time Alice came to help me with the supper. Frank & Mollie Stevens with Laura spent the evening here. Monday August 13th 1894 I believe I feel a little better today. I helped with the work in the forenoon. In the afternoon Leonard washed for us and we put the clothes to soak. We made apple and plum jelly and plum butter. Mother and Robbie were out to stay all the afternoon and get apples. Will discharged Leonard today and hired a german he found on the road. We think he will make good help.